Back in 2008, the musical jukebox / romantic comedy film Mamma Mia! was released, delighting moviegoers with its songs and lightheartedness. Directed by Phyllida Lloyd, the film, which starred a star-studded cast (i.e. Meryl Streep, Pierce Brosnan, Colin Firth, Stellan Skarsgard, Amanda Seyfried) told the story of bride-to-be (Sophie Sheridan), her mother (Donna Sheridan), and the mystery behind the three men (Sam Carmichael, Bill Anderson, and Harry Bright) of who might be Sophie’s father. The film, which was based on the 1999 musical play of the same name, was a jovial affair, filled with singing and dancing, and iconic pop songs from the popular 1970s group ABBA. While the movie did face some criticism from both critics and the general public, Mamma Mia! did have a surprising large box office result, raking in over $615 million against its $52 production budget. That same year, Mamma Mia! became the fifth highest grossing movie of 2008. Now, a decade later, Universal Pictures (and Legendary Entertainment and Playtone) and director Ol Parker present the follow-up motion picture to the 2008 film with the movie Mamma Mia! Here We Go Again. Does this sequel / prequel find its voice in this new day and age of modern cinema or does something get lost within its 10-year gap between films? Ten years have passed and Sophie Sheridan (Amanda Seyfried) is preparing to re-open her mother’s hotel villa (the Bella Donna) on the Greek island of Kalokari, a year after her mother Donna (Meryl Streep) passed away. However, Sophie’s desire to stay on the island and oversee the villa, alongside her manger Fernando Cienfuegos (Andy Garcia), creates tension between her and her husband Sky (Dominic Cooper), who’s in New York City and gets a potential job offer there. When a storm threatens to derail her plans altogether, Sophie struggles to not give up, even with the loving support from her mom’s old pals Tanya (Christine Baranski) and Rosie (Julie Walters), and one of her three dads, Sam (Pierce Brosnan). 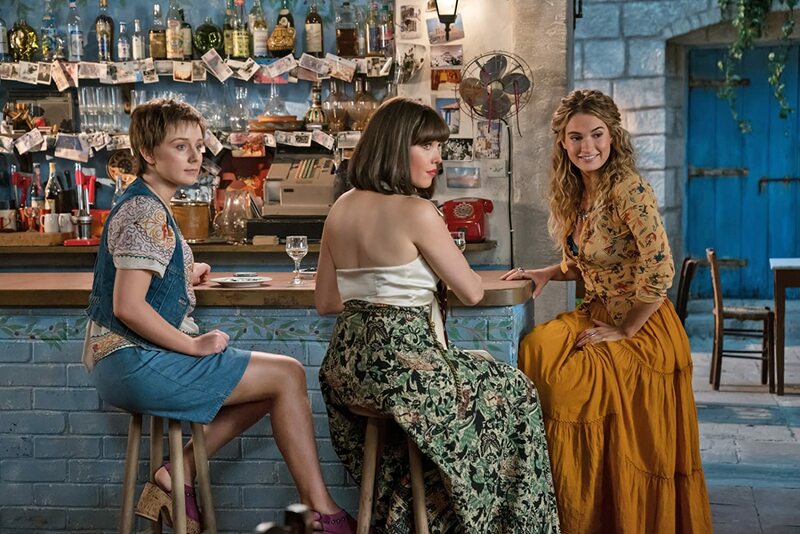 Meanwhile, back in the late 70s, a young Donna Sheridan (Lily James) is fresh out of school and ready for an adventure, bidding farewell to her friends and fellow members of The Dynamos, Rosie Alexa Davies) and Tanya (Jessica Keenan Wynn). As she continues her travels in seeing the world, Donna has her mind set on journeying to Greece (more precisely the island of Kalokari), finding a home within a ramshackle villa, which she forms a connection to and envisions her life within this run-downed dwelling. Along the way, however, Donna also crosses paths with three young men, Harry (Hugh Skinner), Bill (Josh Dylan), and Sam (Jeremy Irvine), who are destined to be linked to her future as well as daughter. Yes, I’ll admit it…. I do like musical movies. Some I do love, especially like recent hits like La La Land and The Greatest Showman, as well as several fan-favorite Disney animated films, but there were some that I just couldn’t get into like Dreamgirls and Chicago. Mamma Mia! was a movie that took by a bit of surprise. It wasn’t because of how original or glamorous the story was, but how many popular actors / actresses (i.e. Streep, Brosnan, Firth, Skarsgard, etc.) as well as the ABBA musical journey (to be honest… I first heard of ABBA’s music from the teen pop group A-Teens). The story, while a bit silly and a tad campy, ultimately worked and told a musical-filled / romantic comedy-esque motion picture. All the film’s singing and dancing made for a solid endeavor (at least to me). It wasn’t super fantastic, but it held its own and was indeed more memorable than most musical films around that time. Heck….it made me want to see the original stage play (I still haven’t seeing it yet, but I do plan to one day). Overall, 2008’s Mamma Mia! was silly, cute, and definitely a fluff crowd pleaser (it won’t offend anyone) that features some of ABBA’s greatest hits. Flash forward to the present (2018) and here comes Mamma Mia: Here We Go Again, the follow-up feature film to the 2008 movie. Apart from the initial announcement of the film been greenlit, I really didn’t hear much about this new movie (via internet). That was…. until I saw the film’s movie trailers, which did peak my interest to see this movie. Of course, my initial reaction (to the film’s movie trailers) were good, especially with many recognizable faces returning to this sequel / prequel installment, and also because I do like actress Lilly James. However, much like a lot of belated sequels films of late, I have feeling that this movie was gonna have that “too little, too late” to fully captivate moviegoers, even if the principal cast and ABBA’s musical songs return. Still, I was hoping for a good musical, especially to sort of “break the ice” to the commonplace big summer tentpole releases. So…. what did I think of it? Well, Mamma Mia! Here We Go Again ultimately works as an unnecessary yet fun prequel / sequel motion picture. It’s silly and a bit thin on the story material, but it’s an unapologetic return to the cinematic world of the original ABBA stage musical-turned movie…. for better or worse. While director Phyllida Lloyd helmed the first film, she passes the directorial baton over to Ol Parker to direct Here We Go Again. With a background knowledge as a screenplay writer (most notably for projects like Grange Hill and The Best Exotic Marigold Hotel as well as directing other feature films like Imagine Me & You and Now is Good, Parker makes Here We Go Again his third directorial outing. To his credit, Parker succeeds with this movie, creating a breezy musical rom-com feature. Much like what Lloyd was able to achieve in the first film, Parker offers up plenty of colorful images of singing and dancing and keeping the whole feature approachable for all ages and entertaining as well. That being said, Here We Go Again gives us (the viewers) a bit of deeper insight into the character of Donna’s backstory, with the movie showcasing the “early days” of Donna coming to Kalokari and crossing paths with the younger versions of Sam, Bill, and Harry. Thus, in terms of drama, the film does have a bit more emotional weight than the first Mamma Mia! as we (the viewers) get to see how Donna met Harry, Sam, and Bill; each one given a different quality and attraction towards the young and adventurous woman. The first movie touched on this subject, but it was mostly through passing dialogue and some old photos here and there. Here We Go Again finally pulls back the curtain on those events as well as capturing the wild / struggling that Donna faces when arriving on Kalokari. All in all, in a motion picture like this, Parker suitable and does a fairly good job in return viewers to the world of Mamma Mia!. Like a lot of musicals, the singing and dancing sequences are of paramount importance and Parker does deliver on that front, creating some creative and fun scenes that capture a lighthearted playful tone as well as still being toe-tappers. To be honest, while the film runs along the same veins and influences to its predecessor, the movie feels (and looks) to have a bit more “pizzazz” than the first film. Naturally, this rolodex of ABBA’s jukebox music works again, with some of the more popular songs (i.e. “Dancing Queen” and, of course, “Mamma Mia” returning and being slightly updated for this film. That doesn’t mean it’s a complete rehash of the songs used in the first movie as Here We Go Again features other ABBA tunes that weren’t previous used in Mamma Mia!. Under Park’s directorial duties, Here We Go Again best musical pieces like “One of Us”, “Waterloo” and a grand finale piece (which I won’t spoil for you guys) benefit from sound solid cinematography, thanks to cinematographer Robert D. Yeoman, who captures the scene in clear cut fashion and draws upon the fullness of a background and its moving parts. Additionally, the choregraphing of the dancing numbers are a bit sharper than the first movie, which does benefit in further enjoying those moments in the movie. I know that sounds a bit much, but you’ll know it when you see. Better still, the singing is slightly more improved. There’s still a few cringeworthy singing notes that occur for some songs (most of them are due to the actors / actresses’ non-background in singing), but it’s not as quite as noticeable as it was in the first one. Essentially, even if you don’t particular care for the story being told in this sequel, the movie’s musical / dancing components ultimately work in the feature’s favor. Looking at the film’s technical merits, Here We Go Again looks pleasing to the eye, enveloping a palpate for colorful visuals and musical numbers. I had already stated Yeoman cinematographer work was great in the movie, but the various time period costume designs by Michael Clapton, the film’s trio of art directors (James Lewis, Andrew Palmer, Jason Virok), and the set decorations by Dominic Capon truly do standout, bringing the movie’s cinematic world (be it time appropriate apparel outfits, background layout, or set piece decorum). Lastly, the film’s musical score, which was composed by Anne Dudley, is also pleasant to listen, keeping in tune with the overall ABBA filled musical celebration as well as a light rom-com motion picture. Unfortunately, Here We Go Again isn’t a perfect feature and (like with a lot of sequels) can’t overtake or even match the first film’s success. Perhaps the most notable (and prominent one) that many will immediately point out is the very existence of the movie. The movie isn’t terrible or bad or anything like that, but Here We Go Again is a pretty unnecessary endeavor. The first Mamma Mia! told a story a from beginning and end and left the tale of Donna and her daughter Sophie (and the mystery behind Sophie’s real father) on a closed and satisfying note. Meaning that the movie was one and done type theatrical film that didn’t require a “franchise” tag of any kind. Here We Go Again continues the Mamma Mia! storyline and only half-succeeds. Yes, it’s fun to catch up with all the characters as well as the sort of showcasing the backstory of a younger Donna, but the whole movie really didn’t need to be told. Thus, the entire film (from start to finish) is unnecessary and renders the movie as an unwanted follow-up sequel that Hollywood pushed out. Also, given the nature of this movie, this also goes back to Hollywood’s recent endeavors in releasing long belated sequel films. Despite the movie being an unwarranted sequel, Here We Go Again should’ve been released sometime ago (maybe like at least 2 or 3 years); much closer to when the first film was released in 2008. Thus, the movie has that “too little, too late” vibe to fully capitalize on the celebratory ideas that Parker and his filmmaking team have in store for Here We Go Again. Additionally, the film’s story, which was penned by Parker as well as co-written by Richard Curtis and Mamma Mia! writer Catherine Johnson, is a flimsy. Yes, while I stated the movie does delve into a bit of deeper in Donna’s backstory, but (again) it’s not really worth going back to explore. Well, to be honest, it would’ve been interesting, if the movie solely focused on Donna’s early years and not so much on Sophie’s story in the present. The flashing back and forth between the two time periods might have worked, but Parker, Curtis, and Johnson have a hard time in filling either plot thread, in both dramatic conflict nor in substance. Thus, each of the two storyline feels a bit undeveloped and could’ve been very easily expanded upon to add more context and narrative purpose. This is most prevalent in Sophie’s story, which has a lot of subplot ideas and scenarios, but the film doesn’t fully develop these challenges in great detail and almost wraps everything up without much problem solving and / or conflict resolution that it makes me feel cheated. There’s just not substance to fill her story arc plot. Also, while interesting to cinematically show, the 70s era storyline (featuring the younger version of Donna) doesn’t reveal much anything new that what’s already been established. Yes, it’s cool to see her character interact with the three younger versions of the men in her life, but (if a person examines it altogether), the movie fails to reveal anything truly significant or otherwise shocking about Donna’s past that’s already been presented in the first movie, especially since the script is handled in a somewhat clumsy way. Even worse, is the movie has a few inconsistencies that noticed once or twice. Makes me wonder if Parker (and the other screenplay writers) even watched the first movie (thoroughly). The resulting factor makes for an unbalance flow of the two intertwining narratives, lacking substance in various parts to fulfill commit to several characters and / or ideas. Naturally, Mamma Mia!’s greatest strength was probably the cast of actors and actresses (some being A-listers and / or very recognizable in previous project endeavors) and how willing they are to be silly and a bit ridiculous (in a cheesy larger-than-life good way). I mean, just seeing Meryl Streep, a very respectable actress in recent Hollywood, been goofy and singing and being very theatrically bold (along with majority of the rest of the cast) was pretty great and which made the movie memorable. Luckily, most (if not all) of the veterans of Mamma Mia! return for Here We Go Again; acting as “getting the band back together” for the movie in all the singing and dancing. Of course, much like how she was big-ticketed star in the first film, actress Meryl Streep reprises her role as Donna Sheridan. Given how the story is structured (i.e. taken place after character’s death), Streep’s screen-time is limited, delegated to more of a large cameo-like appearances in the feature. Still, Streep, known for her roles in The Post, Into the Woods, The Devil Wears Prada, still excels in the small part she plays in the movie and (like before) seems to have fun with it. Naturally, as for most of the comic relief in the movie, supporting character actresses Christine Baranski (Birdcage and A Bad Moms Christmas) and Julie Walters (Harry Potter and the Chamber of Secrets and Paddington 2) proved the best memorable performances of the feature (in the way of side characters), being Donna’s oldest and dearest friends Tanya Chesham-Leigh and Rosie Mulligan. Both Baranski and Walters’s witty back and forth banter still works and is just as effective as ever, with providing great laughs whenever on-screen. The rest of returning characters, which consists of Donna’s love interests, including actor Pierce Brosnan (GoldenEye and The Foreigner) as Sam Carmichael, actor Colin Firth (The King’s Speech and A Single Man) as Harry Bright, and actor Stellan Skarsagard (Pirates of the Caribbean: Dead Men’s Chest and Angels and Demons) as Bill Anderson. Like what I said above, each one seems to be having fun in returning to their post as these characters (just a bit slightly older versions) and are willing to join in the film’s overall silly premise of singing and dancing. It’s like putting on an old pair of shoes…. easy to slide into and feels great to be back, which these seasoned actors and actresses doing with effortless ease. However, perhaps the two weakest link in the movie (even though they are a bit prominent in this story / movie franchise) is actress Amanda Seyfried and actor Dominic Cooper, who play the characters of Sophie Sheridan and her husband Sky. Seyfried, known for her roles in Les Miserable, Dear John, and Mean Girls, carries herself far better in Here We Go Again than in the previous film, maturing in both her acting ability as well as her character in running her mom’s villa. Her singing has also improved slightly, but its still not her strong suit, which isn’t a good thing in being in a musical motion picture. Unfortunately, her story arc in the film is far less compelling and seems all over the place from hotel worries, to relationship troubles, to possible pregnancy woes, to a grandmother confrontation. Yet, despite all those challenges, the character of Sophie lacks the strength in tackling these issues as most just simply resolve themselves (in some way, shape, or form). Thus, Seyfried’s Sophie is stagnant for most of the feature’s runtime, which makes her boring. Likewise, Cooper, known for his roles in Captain America: The First Avenger, Preacher, and My Week with Marilyn, really doesn’t much screen-time to develop his character Sky into a well-rounded one, even if he’s just a supporting player in the cast. Cooper’s acting talents are fine, but he’s just merely a “cog in the Mamma Mia!” machine. He has a subplot with Sophie, but it gets quickly brushed over by the third act begins. Again, much like Seyfried’s Sophie, it’s disappointing and the character is just simply underutilized. Plus, it doesn’t help that Cooper still can’t singing and a duet he has with Seyfried is painful to watch and listen to. Of the new cast, actress Lilly James acts as the main headliner of the feature, playing the younger version of Streep’s character Donna Sheridan. James, known for her roles in Baby Driver, Darkest Hour, and Cinderella, is exceptionally in the movie’s role and is almost the beating heart of the feature (much like how Streep was in the first film). She’s energetic, fun, charismatic, and plus she has the voice to sing, which is great benefit in a musical endeavor. She also can display the right amount of lightheartedness and emotional weight when the particular moment / scene calls for it. 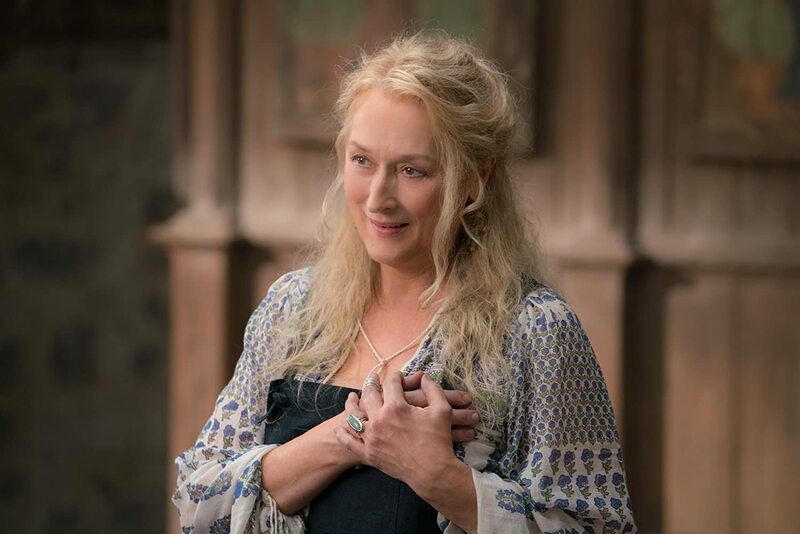 Definitely a perfect casting choice in making James the younger version of Streep’s Donna Sheridan. As supporting characters to James’s Donna, actresses Jessica Keenan Wynn (The Mimic and Forever) and Alexa Davies (Vinyl and Harlots) play the younger version of the characters Tanya and Rosie. To their credit, both Wynn and Davises are solid in the movie, matching the same caliber-ish level as James and do take up the same personas as Baranski and Walters do in their iterations of the character. Unfortunately, the younger version of Donna’s three love interest, including actor Jeremy Irvine (Now is Good and War Horse) as young Sam, actor Josh Dylan (The Little Stranger and Allied) as young Bill, and actor Hugh Skinner (Les Miserable and W1A) as young Harry, fare less in being memorable. Their acting performances are fine and do give a somewhat younger iterations of the Brosnan, Firth, and Skarsagard’ s characters, but, due to how the film is structure, they simply don’t have the well-developed depth to them. Basically, they appear, spend some time with Donna, and then leave. The movie could’ve benefited in revealing more in-depth detail into each one instead of just showcasing a “surface” version of these 20-something versions of Sam, Bill, and Harry. Sadly, these three, despite being pivotal to the story, don’t match James’s performance and are merely plot devices than characters, which (again) is a bit disappointing. Lastly, of the new characters that appear in this movie, musician singer sensation / actress Cher (Burlesque and Moonstruck) and Andy Garcia (Ocean’s 11 and The Godfather: Part III) play Sophie’s grandmother Ruby Sheridan and Sophie’s new manage of the Hotel Bella Donna Fernando Cienfuegos respectfully. Unfortunately, while both have great screen presence, both are horribly underutilized in the movie, acting mostly as glorified cameos. There’s so much more that they could’ve done with these two that it’s a shame that their both reduce to such trivial roles. The songs of ABBA and the story of Donna Sheridan returns to the silver screen in the belated sequel follow-up film Mamma Mia! Here We Go Again. Director Ol Parker’s latest movie sees the return musical journey of Donna and Sophie Sheridan in both continuing their tale forward and looking back into the past. Although the movie is pretty flimsy in its narrative and is mostly a rendered an unnecessary feature (the first film really didn’t warrant a follow-up sequel), the movie is still a good musical feature and does offer the same type of silliness and lighthearted rom-com vibe that made the first film charming and appealing, especially thanks to majority of the film’s cast. To me, this movie was fairly good. Yes, it has its fair share of problems (some of which I really can’t overlook) and really didn’t need to be made (another belated sequel by Hollywood), but it’s still a favorable musical movie. This movie gets some things right (and done better than its predecessor), but the first one had a better story. Could’ve been better? Yes, of course, but the finished product is still good enough. Thus, I would give this movie a “recommended” for fans of musicals and of the first film and then maybe a “rent it” for those non-musical fans (it’s light and breezy enough to warrant at least one viewing of the film). In the end, Mamma Mia! Here We Go Again won’t radically change anyone’s minds on liking this musical, but its still a musical piece of entertainment fluff, even though it’s not really an essential story to reopen once again. Saw this Friday night as part of fundraiser, we left going, why did they make this one? It didn’t bring anything new to the original, and I just felt that the first 20 minutes of the film was excruciating. My partner said of those first 20 minutes, they were dreaming up a way we could get out of the cinema as quickly as possible because it was just that bad. In the end it turned out okay, but…….I won’t be re watching this one again….ever. I know. The movie, while colorfully entertaining, really didn’t need to be made or told. Why even revisit the movie anyways….